Here’s the basic physics: It’s very hard for Earth’s climate system to store heat year-to-year on land. That’s because the oceans can store energy much more easily than land and circulate it through the entire climate system. The global oceans act as giant heat reservoirs and add inertia to the steadily escalating push from human greenhouse gases. El Niño is one of those “natural” forces that climate deniers say can account for fluctuations and for warming the ocean up; a reply might be that man-made climate-change may come to affect even the oceans’ currents. (It already appears to have affected their level of acidification; add to that a new report warning of impending mass oceanic extinctions.) But that point doesn’t even need to be made. This past year was hot without any room for disingenuous excuses. The year 1998 was an outlier, an unusually warm year. If you choose this as your starting point, the next decade will look pretty uneventful. You can do the same thing with lots of other decade-long periods. For example, 1969-85 looks pretty flat, and so does 1981-94. This is typical of noisy data. 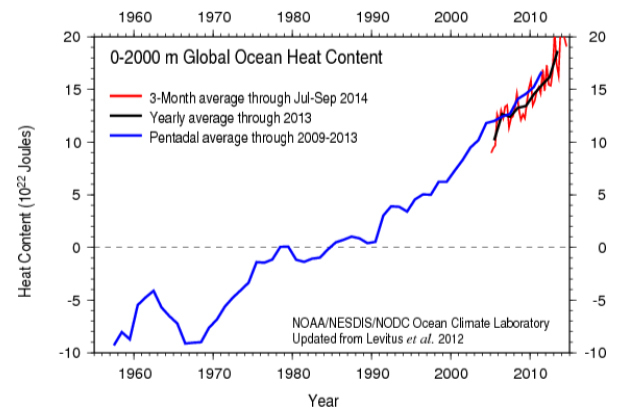 Planetary warming isn’t a smooth upward curve every year. It spikes up and down, and that allows people to play games with the data over short periods. Add to that the fact that warming really does appear to pause a bit now and again, and it’s easy for charlatans to fool the rubes with misleading charts. But in the end, physics and chemistry will do their thing regardless. Earth is warming up, as any honest look at the data makes clear.